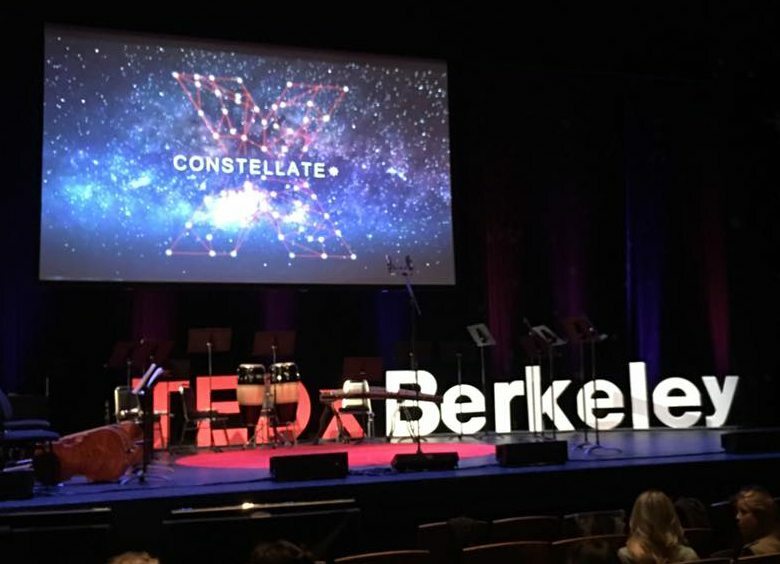 The theme of TEDX Berkeley this year was Constellate and they had an amazing group of speakers. (Check out this post about the conference.) 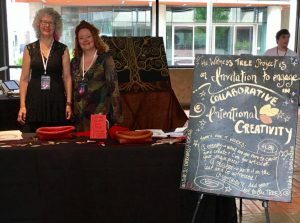 Part of our Intentional Creativity tribe participated in the event on Saturday, April 15th by bringing the Witness Tree to TEDX. Kerry Lee, Tina Greene, Annette Wagner, and Andrea Christiansen were there to lead people through the process and witness them placing their leaves on the tree. What is the Witness Tree? Attendees at the event were invited to engage in Intentional Creativity with the inquiry of: What are you here to cause and create? and then asked to articulate their unique piece, their wishes, dreams or ideas in a few words. They declared this intention by writing it on a paper leaf and gluing it onto the Witness Tree. Annette and Andrea at our table. Annette and Tina witnessing folks stating what they are here to cause and create. 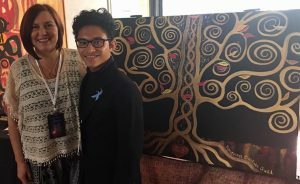 After each leaf was firmly in place on the tree a Guild member, a colorfully dressed artist representing the global Intentional Creativity Guild of teachers, asked the participant one at a time, without the pomp and circumstance of a large crowd or line of people, to state their declaration out loud. For many this was unexpected. We saw eyes grow large, big gulps of air swallowed, and slow smiles emerge as the participant recognized a part of declaring was giving their voice to their wish, idea or dream. Some were quick and ready, and some wanted to come back later after thinking about it. Some were there searching for exactly what they are here on earth to cause and create, and some were focused, sure and on a mission. For many, tears welled in their eyes and courage had to be summoned before being able to speak their truths out loud. All felt something had shifted after being witnessed, and many told a story to go with their part. Hugs and gratitude came easily. We encouraged each participant to remember that if we each held our own piece, simply what they had written on their leaf, all the meaningful declarations would amount to something much greater. Especially as action followed in the coming hours, days, weeks and months. Many came back to “visit” or share their leaves with others as the event progressed. Everyone has a cause even if they don’t know exactly what it is yet. And those who are willing to step outside of their comfort zone will find it. Everyone wants to be heard, to be witnessed, and to have an authentic moment of human-to-human connection. With a stranger seems even more powerful. And to know they make a difference just being who they are. Creativity can be simple, and with intention it’s power still surprises and inspires me even after years of witnessing this. 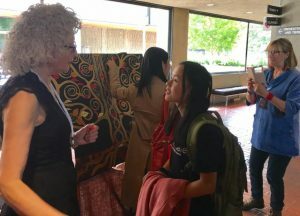 Attendees were a broad cross-section of students, Berkeley-ites, companies, musicians, activists and more. It was very special to see how many folks were willing to join in with us and declare their cause out loud. Creativity at work indeed. Claim. Declare. Witness. Simple yet so very powerful. Imagine if – everyone held their piece, their leaf and then acted upon with intention. What would happen for the greater good of all? 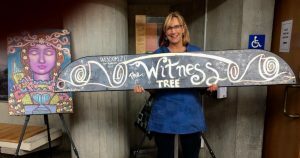 If you are having an event and would like to have the Witness Tree there, contact Kerry Lee for more details. 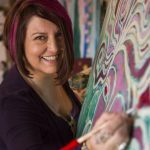 Annette Wagner is a working artist, creativity coach and Intentional Creativity teacher. 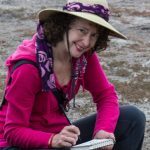 She creates Earth Prayers, a form of Intentional Sketching, which she sends out into the world on an almost daily basis. 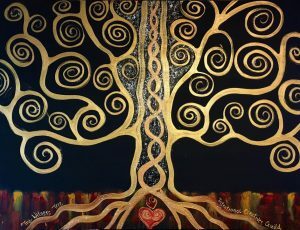 Her intention is to heal our connection to the earth and to share that with others so they can experience that healing connection for themselves. You can follow her on Facebook or Tumblr or visit her at AnnetteWagnerArt.com to purchase an earth prayer of your very own. The Intentional Creativity Foundation is a fully recognised 501(c)3 Corporation. 2015 - 2018 © Intentional Creativity Foundation Inc. All Rights Reserved.